Sometimes the way things look in my head are NOT the way they turn out when I try to execute them. But you know what they say... if at first you don't succeed, try, try again. Case in point: this post. 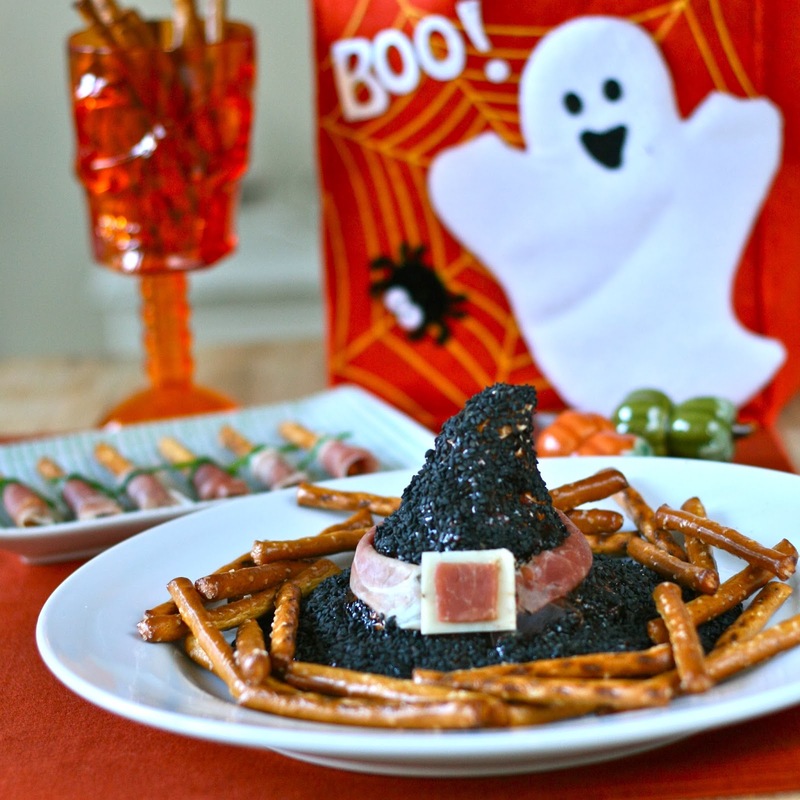 My vision for these fun fall appetizers was totally different than what it turned out to be, but I think they are equally adorable and perfect for your Halloween get togethers! I brought the "witch hat" to book club last night. We carved pumpkins, chatted (a little) about this month's book (Orange is the New Black), and drank lots of wine. (Mine is the smiley one on the right... sort of what I look like when I've had too much prosecco). My original plan for these little witch's broomsticks was to do something similar to what I found on Cociando con Catman, which uses a pretzel stick, cheese slice and chive. Well, I bought pepper jack (because I love pepper jack), but the peppers sort of prevented me from rolling the cheese around the pretzel (the cheese slices ended up just breaking). Luckily I had some prosciutto on hand, so I used that instead. (Tip: I found the chives much easier to tie by keeping them in a bowl of water). I tried cutting the ends like in the cheese version, but it ended up looking like a creepy foot. Which, if that's what you want to go for... more power to ya. It also works for the Halloween theme. But for regular ol' brooms, I don't think it's necessary. While these are more for looks than anything, I will say they taste great too. The chive really adds a little kick to the meat/pretzel flavor. The cheese ball is a take on one of my mom's go-to appetizers. It's super simple, but so good. She basically takes a bottle of raspberry chipotle sauce and dumps it on some cream cheese and serves it with crackers. The best is when she brings the sauce from Montana, which also has huckleberry in it. 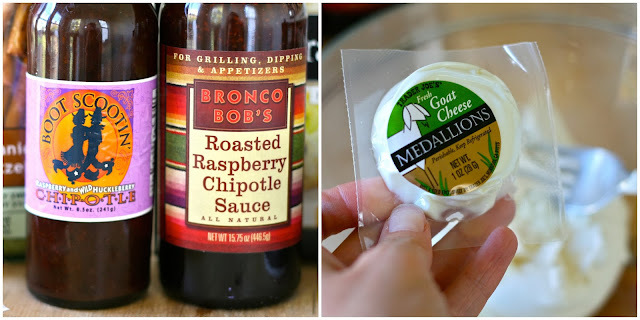 (However, I've seen regular raspberry chipotle sauce at Whole Foods and other similar stores). You could also sub pepper jelly, but I love the smokiness the chipotle sauce adds to this appetizer. She doesn't add goat cheese to hers, but I had a couple of these medallions from Trader Joe's on hand, so I decided to add a couple of those to the cream cheese. You could even mix a little of the chipotle sauce IN the cheese mixture in addition to pouring on top. Some other yummy additions to the cheese mixture would be: kalamata olives, sun dried tomatoes, crumbled bacon, shredded cheese and/or fresh herbs. 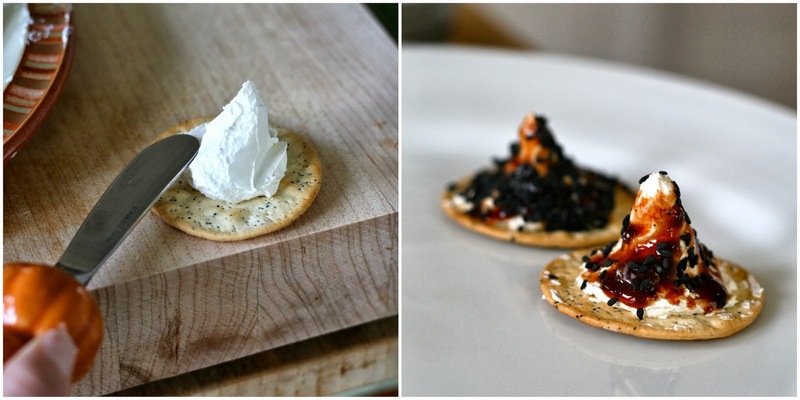 My original idea for the cheese/chipotle combo was to make individual hats using crackers for the "brims." However, making the cream cheese hats individually was taking FOREVER. Plus, it wasn't totally practical because they would be hard to make ahead of time since you wouldn't want the crackers in the fridge. Also, while delicious, it was a lot of cheese for one little cracker. And if I'm being honest, they didn't look like hats really so I scrapped it. Instead, I decided to make one large witch hat out of the cream cheese/goat cheese mixture. Spread about 1/3 of it onto a round plate. Roll the other 2/3 into a large ball and set on top. Using a spatula, form into a hat. Cover with raspberry chipotle sauce and then sprinkle or press black sesame seeds on top. (Poppy seeds would work too). For the "buckle" I just used some prosciutto and some of my pepper jack that didn't get used. You could also do sliced carrots, cheddar cheese slices, green onions, pretzel sticks or more cream cheese rolled into a little log. 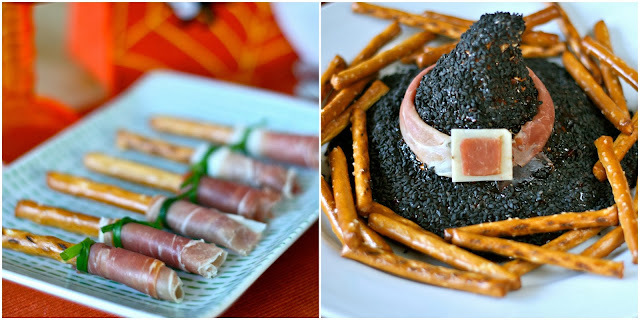 Serve with crackers or additional pretzel sticks. Speaking of Halloween party snacks... here a few more ideas to spook up your soiree. 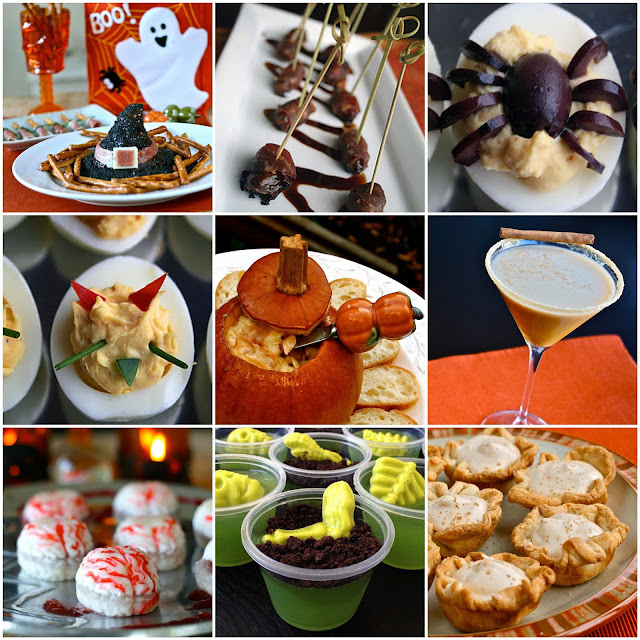 Devils on Horseback, Spider Eggs, Devilish Eggs, Pumpkin Fondue, Pumpkintinis, Brain Jello shots, Zombie Jello Shots, and Caramel Apple Pie Pudding Shots for dessert. Happy Halloween! optional additions to cheese mixture: sun dried tomatoes, olives, crumbled bacon, fresh herbs, shredded cheese, etc. 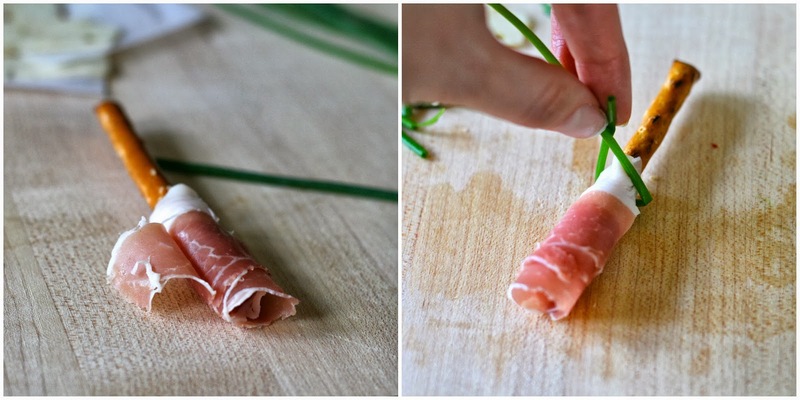 Cut each slice of prosciutto into 2-4 pieces, depending on size of slices. Wrap around pretzel stick and secure with a chive. Combine cheeses in a medium bowl. Either thoroughly mix by hand, or use an electric mixer to combine. Stir in any other additions such as tomatoes, olives, herbs, etc. Spread 1/3 of mixture on round serving plate. Form remaining 2/3 of mixture into a ball and return everything to fridge for 30 minutes to firm up. Place ball on top of cheese mixture that has been spread onto the serving plate. Form into a pointed witch hat. 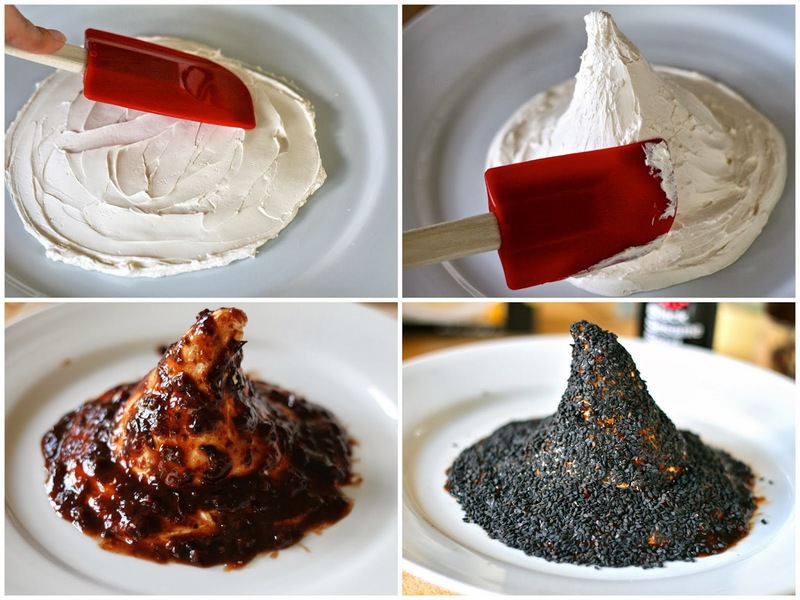 Cover with chipotle sauce and then sprinkle or press black sesame seeds. Attach buckle and arrange crackers around cheese ball to serve.